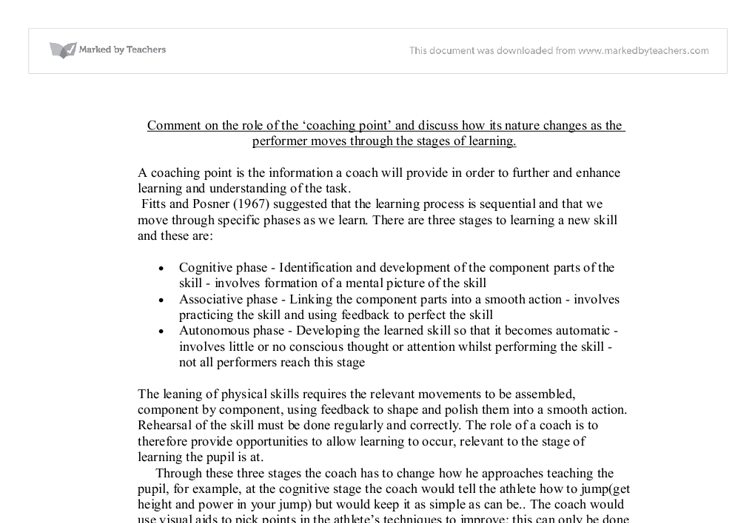 Comment on the role of the 'coaching point' and discuss how its nature changes as the performer moves through the stages of learning. A coaching point is the information a coach will provide in order to further and enhance learning and understanding of the task. Fitts and Posner (1967) suggested that the learning process is sequential and that we move through specific phases as we learn. There are three stages to learning a new skill and these are: * Cognitive phase - Identification and development of the component parts of the skill - involves formation of a mental picture of the skill * Associative phase - Linking the component parts into a smooth action - involves practicing the skill and using feedback to perfect the skill * Autonomous phase - Developing the learned skill so that it becomes automatic - involves little or no conscious thought or attention whilst performing the skill - not all performers reach this stage The leaning of physical skills requires the relevant movements to be assembled, component by component, using feedback to shape and polish them into a smooth action. Rehearsal of the skill must be done regularly and correctly. ...read more. The last major point in the cognitive stage of learning is the feedback the coach gives (confirming). This could be seen as the most important part, it both helps the coach understand what has been learned but to also encourage the leaner to be self-evaluative and reinforces learning plus boosts the moral of the learner. 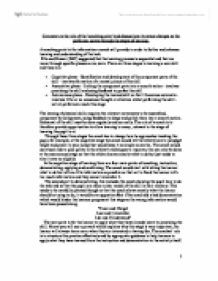 The coach would use verbal guidance throughout this stage but with the learner being a beginner it may be more appropriate to express the cues in ways that may not be 100% accurate, but convey the feeling of movement to the learner. E.g. 'Stretch you toes to the ceiling' or 'crocodile, monkey, mouse' (the arm movement in breast stroke). The next stage of learning (the associative phase) the coach would have to change how they encounter the problem of teaching the learner the correct amount of information. Sharp (1992) differentiates between 'practice' (without guidance) and 'training' (practice with guidance). The learner would need to practice on there own without guidance at some point but long periods could prove demotivating. It could also allow the development of errors without techniques/skills learnt that take a lot of removing which could waste up to 6 month. ...read more. visual aids in this way would also help the athlete to set new targets which is very important at an elite status so that the learner just don't give up. A good example of this was Colin Jackson; he was and still is the record holder of the indoor 60m hurdles and outdoor 110m hurdles. In 2002 he set himself a target of winning three international honours - the first he captured in Vienna in March winning the European Indoor 60m hurdles title for the fourth time. In summer 2002 he missed out on adding a third Gold medal to his Commonwealth tally after hitting the first hurdle but recovered amazingly to claim his second Silver medal in this event. The European Championships in Munich saw Colin bring home the Gold medal for the 4th time. Colin Jackson is now retired but setting targets with his coaches helped him mentally and made him able to strive for an objective than he could possible have done. Through all of these stages the coach is helping the athlete to progress, each stage having its very own way of teaching. Each stage is different to the other but has the same effect on the athlete, to enhance there progression of learning. Word Count - 1233 ...read more. Again, judging the pace and accuracy accordingly. To teach this skill I would use the Whole Practice method. I would use this method because, despite the skill being highly complex, it is not time consuming and all the actions are closely linked together. Confidence 8/10. Andrew is known for his confidence in his shots and bowling, however I felt he wasn't particularly confident in this mat with his batting on the other hand shoed good confidence in his bowling getting the wicket he deserved. Pressure 7/10. Demonstrations are also very time efficient and provide an immediate picture of the skill, saving the coach from expressing the task in words. as they watch the performance of the skill and analysis it so that the player could say to himself next time I would be able to notice I did that wrong. E.g. the badminton player is now aware of what needs to be done in the serve, and can notice her errors if any made after the serve. * Speed endurance. Why: Rugby is not a sport that requires players to run in straight lines all the time. Players need to be able to change direction without losing pace. To improve acceleration & speed the resistance parachute provides additional resistance for sprint training and is very good for rugby. This was repeated in a similar fashion for all training sessions, keeping the mental skills training constant whilst changing the physical training to suit the teams needs 10. At the end of the beginning phase of research, both team competed in a 2x5 minute halved recorded water polo game 11.